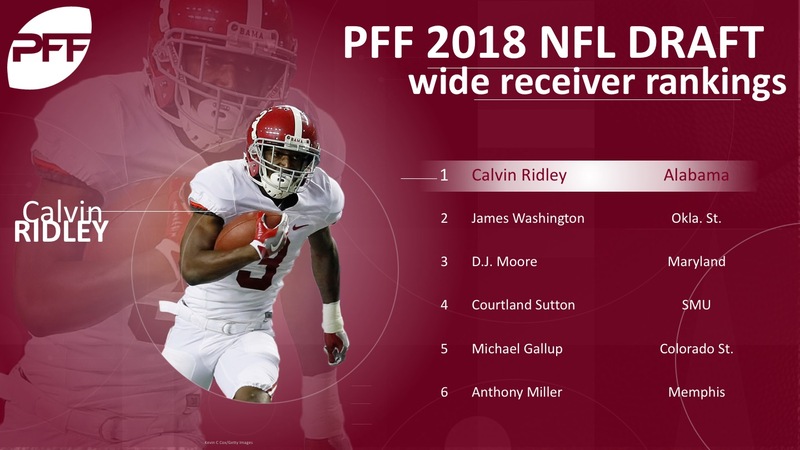 The 2018 NFL Draft wide receiver class lacks true consensus No. 1 options, but it’s loaded with No. 2 and No. 3 potential threats. From bigger receivers, to slot options, to hybrids, this class offers something for everyone depending on the desired skillset. There may not be many first-round receivers in the class, but there’s talent to be had in the middle rounds for sure. Ridley has excellent speed that shows up down the field and in his route-running, making him one of the more dynamic options in the class. His production was limited in Alabama’s scheme, but he averaged 45.1 yards on his deep catches, showing what he’s capable at the next level. His age is a question mark as he’ll be 23 on opening day, but his downfield ability pushes him toward the top of the class.